Now marking over one year on the top of the list, CallTrackingMetrics has again been named the top call tracking service by topseos.com, an independent authority that ranks the best companies in the internet marketing industry. 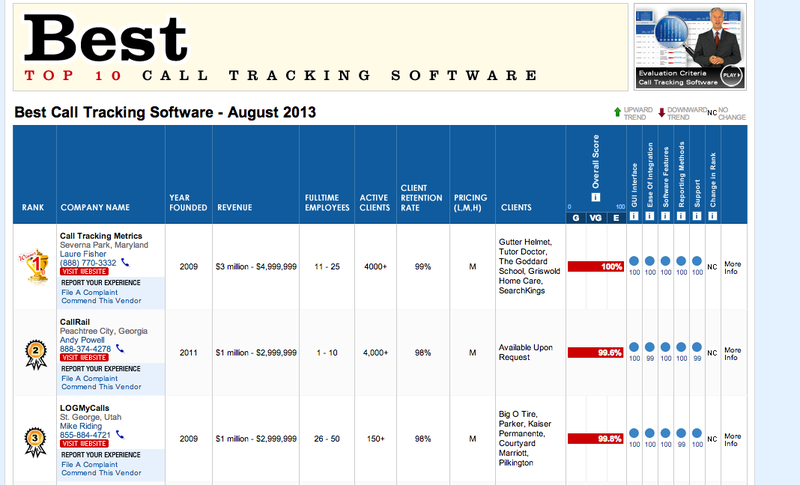 CallTrackingMetrics is delighted to have once again been placed in the #1 spot by topseos.com for August 2013. topseos conducts an in-depth analysis each month where they evaluate the features of the top call tracking software products out there and compare them against each other to evaluate ease of use, ease of integration, product feature set, technical support available, and the reporting methods that the software provides. CallTrackingMetrics currently supports over 4000 businesses around the world with their call tracking needs. To learn more about our service and how we can help your business, visit us at: https://calltrackingmetrics.com or contact us at 1-800-577-1872. CallTrackingMetrics is delighted to be named the top call tracking vendor again in August.